First off I want to apologize to Miguel Guerra. I’ve had Samurai Elf sitting on my bookshelf for a few months, I’m just getting to the review now. I have no excuse, this one just took me longer than usual…sorry dude. As I was reading Samurai Elf, I couldn’t help but think this is was Middle Earth would be like two-thousand years after the Lord of the Rings books. The elves have left the land, but there’s one who was left behind, our hero Ardan. There are a few dwarfs left and they’ve become battle masters who run training schools. Then we see the bad-guys, know as The Horde, who are technologically advanced with airships and energy weapons. This is where I was whisked back to my childhood where there were plenty of Saturday afternoon movies that featured barbarian sword-slingers pitted against some space faring menace, and it was nothing but pure entertainment. I don’t recall anyone ever saying their life was changed by the movie Krull. 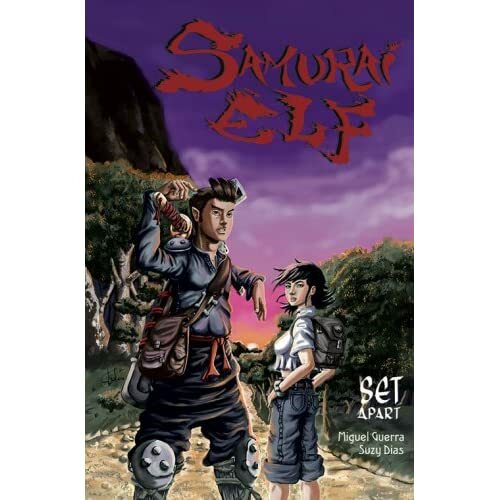 Samurai Elf is filled with archetypes from various genres. It’s got the young hero who harbors great power, the old master, faceless badguys, cute yet dangerous woman, it’s all here. Miguel Guerra creates a vast rich world. A world where the reader is certain there is a deep history that will be explained in later volumes. The dialogue is straight forward and easy to follow and great for new comic readers or developing readers. Which brings me to one of the issues that caught me off guard. The language used in 99% of the book is safe for young readers, but there is 1% that forces me to not recommend this book for young readers. The story is 180 pages long and on page 107 there is some harsh language that, to me, seemed to come out of left field and not fit the rest of the book. Especially since on page 142, Guerra forgoes the swearing for the good ‘ole comic “!@#$”. This is not a big issue for most people, but I do feel that it was unneeded and it took me out of the story. Overall this was a fun read and I look forward to the second installment of Samurai Elf.